Natural Ayurvedic Treatment for Parkinson | ND Care Nirogam Pvt. Ltd. In Ayurveda, Parkinson's disease is described as Kampavata which occurs due to exaggeration of Vata Dosha. As the vitiation of Vata Dosha is pre-dominant in old age, Parkinson tremors generally occur in old age. Parkinson disease is a neuro-degenerative disorder. Hence, Ayurvedic treatment for Parkinson focuses on balancing Vata to naturally control the body movements. Best Parkinson doctor uses natural remedies for Parkinson disease to treat difficulty in walking, talking, trembling of the limbs, and head. The potential cause for Parkinson is believed to be a faulty lifestyle which aggravates the Vata Dosha in the body, for instance, improper Aahar and Vihar regimen. This excess Vata travels in the body through Srotas (microchannels) and occupies available free spaces. Gradually, after some time such unhealthy accumulations of Vata Dosha in the body lead to the development of the symptoms of Parkinson (Kampavata). Nidaan Parivarjana:- The natural treatment for Parkinson's deals with the treatment of the etiological factors responsible for Parkinson's tremors. In the treatment of Parkinson, patients are guided to avoid such type of Aahar and Vihar (diet and lifestyle) which increases the Vata in an unhealthy manner. The food having Rookshaya (dry), Laghu (light), Sheet (cold), Daruna (unstable), Khara(rough) and Vishada (clear) is generally not recommended for the Parkinson's patients. Shanshodhan (removing of accumulated Dosha from the body):- In this line of treatment, exaggerated Vata Dosha is expelled out from the body via Snehana, Abhyanga, Swedana, Nasya, & Basti. Nirogamz Braino-A "Ayurvedic Cerebral Activator"
Treats memory loss, memory fatigue, anxiety, & depression. Kapikacchu (Mucuna pruriens): - Kapikacchu seeds have been reported as a good source of vital ingredients. The extracts of the Mucuna pruriens seeds have shown potent anti-Parkinsonian properties. Brahmi (Bacopa monnieri): - As per Ayurveda, Brahmi is a Medhya Rasayana. 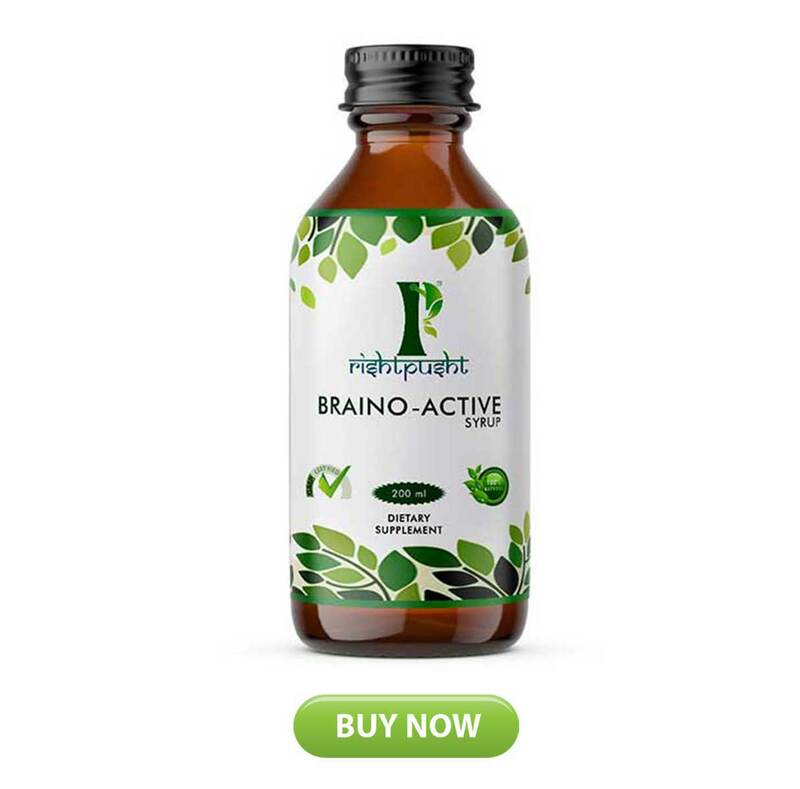 It naturally enhances memory and revitalizes brain function. Brahmi prevents the death of the bio-molecules and prevents the motor symptoms which are typically present in Parkinson. Turmeric (Curcuma longa): - It exhibits therapeutic activities, such as antioxidant and anti-inflammatory. It is a neuro-protective agent as it is capable of crossing the blood-brain barrier and thus naturally helps in treating Parkinson. Ashwagandha (Withania somnifera): - Its extract shows significant improvement with motor neurons function. This herb can also achieve reduced inflammation, stress, modulate immunity, and improve cognition. Garlic (Allium sativum): - Garlic extract contains several vital compounds that are vital and beneficial in balancing Vata components. It is also known as a wonderful mega resource that controls oxidative damage to neurons. Thus, it helps in treating Parkinson naturally. Create a relaxing pre-bedtime routine and follow it every night. Get plenty of natural light during the day which is a natural remedy for Parkinson disease. Avoid screens and keep your room dark at night. Make sure your mattress and pillow are comfortable and support you well. Coconut oil and red palm oil contain powerful "brain food" substances called ketones. The healthy fats in coconut and red palm oil also help to repair and rebuild the nerve lining or myelin sheath. By doing this, brain communication is enhanced and nerve functions are intensified and thus naturally treat Parkinson. According to Ayurveda Madhur, Amla and Lavana Rasa are good for health in Vata diseases. Eat high fiber-rich foods whole grain cereals, brown rice, green leafy vegetables. Drink 10-12 glass of water per day. Limit sugary foods & avoid saturated foods like butter. Avoid fried greasy foods, carbonated beverages, & limit salt intake. Bhujangasana: - It is crucial to expand the muscles around the chest so that they don't restrict the lungs in the process of expansion. Setu bandhasana ( Bridge pose ): - It helps in strengthening the back extensors which are generally weakened because of the forwarded posture. Anulom Vilom: - In later stages of Parkinsonism, round shoulder syndrome is apparent which results in the tightness of chest muscles. Slowly and gradually lungs are not able to expand, thereby reducing the oxygen levels in the body. This Pranayama helps in increasing oxygen levels and expansion of the chest. Bhramari: - It has the same purpose of increasing oxygen concentration in blood. It also helps in relaxation of the body to provide stress relief and enhancement of concentration and memory. Stretching exercise:- As one of the main symptoms of the characteristic triad of Parkinsonism is rigidity, stretching exercise for the body is of utmost importance. Balance training:- As the patient with Parkinsonism has festinating gait so their balance is also altered -balance training reduces the fall risks in patients which would further lead to secondary impairments.